As we begin the New Year, it is the traditional time to review the past year and make some resolutions to improve aspects of our lives in the coming year. In addition to the perennial favorites of losing weight and getting more exercise, improving our financial lives is always near the top of the list. The first of the year is always a good time to review your financial life to check your progress from the prior year, but it may be more important than ever as the country is in an economic slowdown. We do not know how long or deep this slowdown may be, but having a good handle on your finances will help you through whatever comes. While resolutions themselves are fine, if we truly want to see changes, we must do more than “resolve” to make changes; we must have a plan for doing so. If we desire to make improvements in our financial life, we must start at the beginning and be familiar with our current financial status as well as our eventual goals. Most of us don’t know what to do first. Unfortunately, unless you were blessed with parents who were good financial managers and tutored you early in life, you most likely did not receive an adequate financial education. If financial literacy was not taught at home, most of us had to learn it the hard way in the “school of hard knocks.” So here are the steps that can help to lead you to financial clarity. The following action list is neither original nor exciting, but it is absolutely true that there can be no financial independence without a system which monitors your income and tracks your expenses. As a result — and perhaps mundane — this process of getting your finances under control is, without a doubt, the first step towards a brighter financial future. If you are among the rare individuals who faithfully use Quicken or Microsoft Money or some other budgeting/expense tracking software or system and actually follow the process faithfully, you probably already know the state of your balance sheet and how your money is spent, but you, too, may pick up a few practical ideas. Said another way, list everything you “own” and everything you “owe.” Start with your home, retirement accounts, savings accounts, and investment brokerage accounts. This might take a few minutes, but since nearly every savings or retirement account sends at least a quarterly statement, the statements should be relatively easy to track down. Be realistic about the price of your home, given that it may be substantially down from the market high several years ago. It is most important to list all of your “liquid” assets such as bank accounts and other accounts which you can easily convert to cash, but if you like, you can also list your home furnishings, etc. This is a very “soft” number in the final analysis, so don’t spend a lot of time trying to figure out what your furniture is worth. It is probably worth about 30% of what you paid for it. I would round to the nearest $10,000 and move on. Your liabilities would typically include the mortgage on the home, possibly a second trust deed or “line of credit.” Other items might include car loans, credit cards, and “zero interest same as cash” consumer loans for various household appliances and furnishings. As you list each debt, also note the monthly payment and the current interest rates. If you finish this first step, you will have already surpassed the multitudes of your fellow citizens who have no idea how much debt they carry or what the interest rates are. Once you have your assets and liabilities, list them on one page, with the assets on the left and the liabilities on the right. At the bottom, subtract the liabilities from your assets. This will be your total net worth. Ideally, your net worth will be a substantial positive number. Your “net worth” will be very useful in the future as a benchmark to confirm that you are making progress towards increasing your assets and reducing your liabilities. Over time, as you update the numbers on your balance sheet, hopefully you will see your net worth increasing over time. This means that after all your debts are counted, you have accumulated some level of wealth which can eventually grow larger. The key to all financial success is to spend less than you earn and allow the savings to compound over time until it generates enough to cover your monthly bills. Simple to explain but very difficult for most of us to achieve since we all tend to sabotage ourselves along the way. If your net worth is negative, it is an indicator of problems. Excessive debts and inadequate savings will cause the net worth to be negative. Sometimes a negative net worth is the result of a short-term problem that will be corrected over time such as high student loan debt or the result of a business failure or home foreclosure. Frequently, a negative net worth is the way we begin our business lives, but careful attention should be paid to fixing this problem as quickly as possible. The remedy is to dramatically reduce the debt and increase the savings. This may take some time, but reducing the debt levels so the savings can grow is a mandatory step along the road to financial independence. If the debts are allowed to grow under the weight of high consumer interest rates, no measure of future financial independence will be possible. Start with your take-home pay from the past year (1099s and pay stubs) and divide by 12 to get an average monthly income. For the self-employed, calculating your income can be difficult, given that the income numbers can vary widely from month to month. A 12-month average income will give you a good place to start. List any other income streams such as net rental income (income after all expenses) and income you receive from savings and investment accounts. Do not count investment income that is being reinvested, only that which is paid out to you each month. Once you have your monthly income listed, begin to list your monthly bills. You might want to pull out your checkbook for this part of the exercise. List all your major monthly bills that are not discretionary such as your mortgage or rent, car payment, homeowner’s and life insurance, utilities, and grocery bills. These should be fairly easy to capture. The remainder of the monthly bills are probably variable and discretionary. Be sure to count bills that are paid annually like real estate taxes and/or insurance premiums. Check credit card statements for dining out, gifts, and items that do not occur each month. If you use only one checkbook in your household, gather your last few bank statements and review the total monthly outflow from your account. This number will include all checks written, automatic withdrawals set up with your vendors or bills paid online as well as any cash that you spent. Your total outflow should match up with the outflow shown on your checking statement, but if you are like most of us, it won’t. When most of us compare our income with the list of bills we have each month, there is a gap between what the budget says we should have and what the bank statement says we actually have. It is common to see $500 per month or more of “financial leakage” in the form of cash spending that is not tracked (e.g., the daily café mocha frapaccino) as well as impulse spending. Once the net worth is calculated, this will be the benchmark used during the year to see how we are doing in reducing the debts and increasing the assets. It will serve as encouragement when our net worth increases over time as you make progress. Once the balance sheet is recorded, it will be easy to update the values, thus making the process much easier the next time you review your finances. In reviewing debts, total the current monthly payments for your debts (mortgage, auto loans, credit cards, and any other debt payments), and compare this to your gross (pre-tax) monthly income. Banks and mortgage companies use this ratio as an indicator of your financial health. Ideally, when you count all your debt payments together, the ratio should be no more than 35-40% of your gross income. If your ratio is higher than 35%, it is vitally important to do whatever you have to do to reduce your debt loan. For you math majors, there is another way to reduce the debt ratio….. just increase your total monthly gross income. Not only is this easier said than done, experience has shown that if you cannot assert firm control over your debts at your current income, then it will only become more difficult at a higher income level. There are millions of Americans earning high incomes who are also buried in debt. In an ideal world where you have no credit card debt or car payments, the debt ratio will only count the monthly mortgage payment as a ratio of your monthly income. This is the best scenario which allows for the greatest contributions to your retirement and savings programs. Take another look at your newly-constructed balance sheet, and total all the assets that are liquid. These are savings accounts, Certificates of Deposit (CDs) as well as short-term bond funds. Ideally, for an employee of a company in a stable industry, you should hold at least three months times your monthly spending in accounts that allow you easy access in case of an unusual expense or a temporary disruption in your income. Example: If the monthly after-tax spending is $4,000 per month, the target cash reserve would be 3x $4,000 or $12,000. Saving for a rainy day has become so passé in our society that it is rare for an individual under 40 years old to have cash reserves of any significance. This is the reason you see commercials for short-term insurance products like AFLAC. In the past, we saved for emergencies, but today, we are sold supplemental insurance to cover our lack of discipline. For those reporters who are self-employed, you should have a target of six months times your monthly after-tax income need, since you may have more variability in your monthly income. That would be 6 x $4,000 or $24,000 as the target for the cash reserves. While this may seem like an impossible amount to accumulate, with some effort, you may be surprised how quickly you can attain it. If you find that your cash reserves are low, a temporary solution while you are saving is to have an equity line of credit on your house available if you have an emergency. Once you begin drawing funds out, you will have to pay the interest on the borrowed funds, but it is always better to have the line of credit in place when you do not need it, because the banks can be very difficult to deal with when you have an emergency and come to them for a loan. Get the line of credit when you do not need it, and leave it open for use in an emergency to supplement your existing cash reserves. Regardless of your eventual savings and retirement goals, starting your savings early in your working life will pay huge dividends. If you are fortunate enough not to have accrued school debts and your other debts are under control, if you begin saving early in your career, a monthly savings target of 10 – 15% your gross income will likely be enough to fund most retirement goals. As soon as your cash reserves are in place, begin to invest in a tax-qualified plan. Examples of retirement plans are: SEP IRAs, Simple IRAs, and Solo-K programs. While each of these allows for pre-tax contributions to accrue to your account, they each have different rules and different contribution limits. In addition, depending on your income, you can also make contributions to your individual IRA or Roth IRA. If you are starting late with your retirement savings, it is likely that you will need to direct more to your retirement funds to catch up. You may have to dedicate 20% of your income to your investments to give your portfolio the boost it will require to grow substantial enough for your future needs. Starting early is by far the easier path, but there is no getting around the math that the later you begin saving, the more you will have to contribute each month to accumulate enough to have the income in the future. 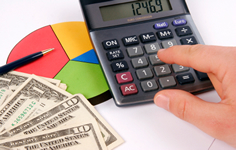 Once the retirement accounts are established, the business of picking the investments begins. More ink and paper are used in trying to convince consumers that there is a way to “beat the market” than any other topic in financial journalism. The truth is that most mutual funds cannot beat their benchmark over long periods of time, so it is generally best to buy broadly diversified mutual funds with the lowest internal expenses and hold them for the long run. While it is human nature to search for the “smart adviser” who has a “proprietary computer model” that enables them to find the best stock to buy and sell at any given time, the truth is that investing in individual stocks is a very risky business, and it subjects investors to risks for which they are not normally compensated. Vanguard Index Funds come to mind as a prudent solution, although there are other options that also provide the broad diversification at a low cost. Beware of mutual funds that charge you a fee to buy them. There are plenty of very good funds available to individual investors that do not charge a “load” or initial sales fee. If you are using an adviser who sells only loaded mutual funds, make sure you fully understand all the costs associated with this decision. Frequently, the loaded funds provide much more for the salesman than they do for the investor. For the individual investor who wants to build their own portfolio, there are many useful sites on the Internet to assist you. One of the better known resources is Morning-star for unbiased research information. http://www.morningstar.com/. Investing may be the most interesting and exciting part of financial success, but investing is really only possible when we have accomplished the earlier task of the balance sheet and budget. If you do not have anything left at the end of the month for savings and investments, it does not matter if you are picking the best mutual funds in the world; you will not have any money to invest. For busy people and others who do not have any interest in investing, it might make sense to enlist the help of a qualified adviser to help get you on track and keep you on track. The Financial Planning Association gives access to a large network of Certified Financial Planner® practitioners who have undertaken substantial classroom training, experience, and passed a rigorous two-day exam. You can search the site for an adviser in your area, review their areas of expertise, and access their websites. Another great resource for advisers is the National Association of Personal Financial Advisors (NAPFA). At the bottom of the home page there is a “Find an Adviser” tab. This site lists advisers who work only on a fee basis and are not compensated by sales commissions. You might also check the Garrett Planning Network of financial advisers. The Garrett Network includes advisers who work on an hourly, as-needed basis, and they would be a good resource for helping you to get started with the process. This site also has an excellent library of useful books to help you learn more about how to handle finances. I highly recommend this site. One final site I highly encourage you to bookmark is http://www.360financialliteracy.org/. This site was established by the AICPA, an association of Certified Public Accountants. This site gives great information on many topics divided conveniently by life cycle. It is a terrific resource. Though much of this article was dedicated to the mundane issues of constructing a balance sheet and budgeting, there are no substitutes for these critical skills. Just as a foundation is critical to the construction of a building, the balance sheet and monthly budget are critical to building the foundation for a strong financial life. Good luck in your quest towards achieving your financial goals. Peter Kozak is a member of NCRA and this article was originally posted on their website.